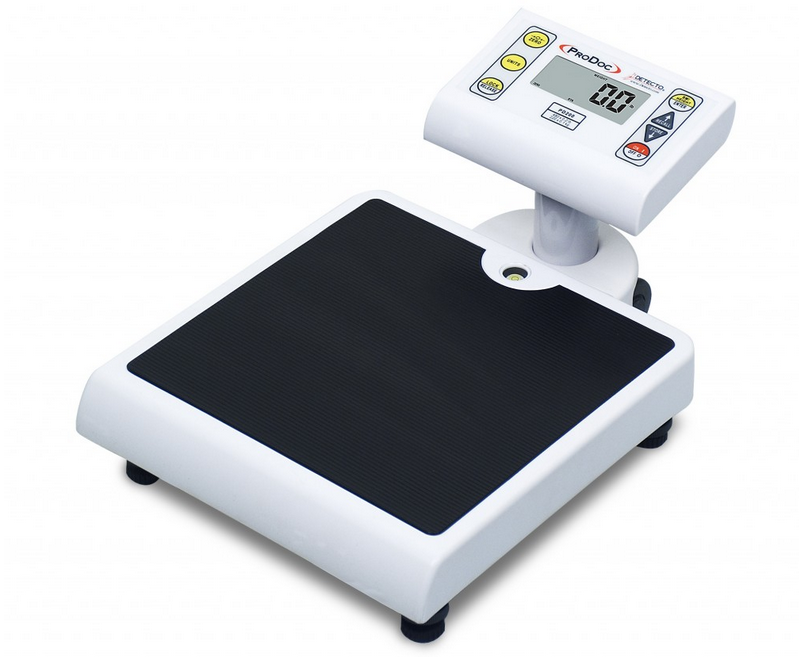 The PD200 ProDoc Scale, by Detecto, is a medical-grade scale that will fit in any clinic, hospital, or home setting. This is a scale to get quick, highly accurate, body weight and body composition measurements for people with a variety of body types and weights. Like the Detecto PD100 model, the PD200 offers a large, heavy-duty base support body weight up to 480 pounds or 220 kilograms, making it a good bariatric scale choice. And like the PD100, it also has four rubberized locking feet that can be height adjusted and will operate on any level floor surface. It has medical-grade accuracy and registers weight through its bold one-inch remote display. The display sits elevated on the base and has enough clearance to allow any sized feet to rest on the scale without interference with the reading. The weight readouts are displayed to two-tenths of a pound increment. The elevated display has several features that make storing weight measurements and determining BMI easy. With the intuitive button options, weights can be stored for later recall after the person weighed steps off the device. The weight measurement can be switched from pounds to kilograms. Those weight numbers can also be correlated to BMI percentage with the user punching in a height. 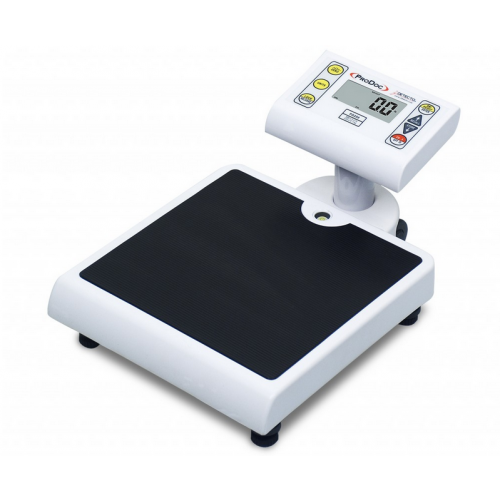 The scale is powered by 6 AA batteries (not included) or an optional AC power cable (PD-AC). The PD200 is factory assembled and will work right out of the box. The weight measurement is of medical-grade accuracy. Inputting the height to correlate with the weight, a BMI percentage will be displayed. It has an angled display for easy viewing.